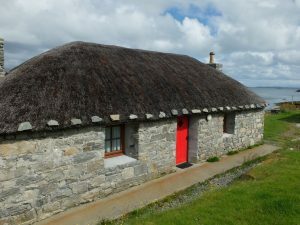 30 Backhill, Berneray, is a luxury, detached cottage by the edge of the sea on the beautiful island of Berneray, off North Uist in the Outer Hebrides. 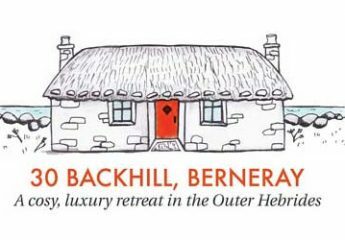 The stone walls and brightly painted front door, under the Loch Tay thatched roof, are immediately indicative of the absolute romanticism of this superb ‘get away from it all’ cottage. The interior is immaculate, and beautifully maintained. All the rooms have views of the sea and across the bay. Once inside, the rest of the world disappears as you listen to the tide rolling in and out, and the seals chattering on the rocks in the morning and evening. Watch the ferry on the far horizon make its way to Leverburgh across the Sound of Harris and in the evening enjoy the harbour lights and the amazing starry skies. The open-plan sitting room has a wood-burning stove and there is background electric heating which will keep you cosy in all weathers. The hot water is literally on tap, and with a dish-washer in the fully-fitted kitchen, there is everything you need to have an easy time of it. The bedroom has a super-king-sized bed, again with a sea view, and all is decorated elegantly and with every attention to your comfort. If you are lucky you will see otters playing on the rocks and golden and sea-eagles will almost certainly be spotted, though the elusive corncrake, is still (for us) a case of heard but not seen! The machair flowers are beautiful for many months of the year, especially May and June, and there are many fabulous walks to be enjoyed along stunning West Beach, and around and across this gem of an island. The island has so much to offer at any time of year: in the depths of winter the short days and long nights make the cosiness of the cottage especially wonderful. You can find out more about visiting the Outer Hebrides here.